Corella pears are small to medium in size and are irregular in shape ranging from oblong to squat with a large base that tapers to a smaller, rounded neck. The smooth skin has a mixture of green and yellow hues with some red blushing and prominent lenticels. The ivory to pale white flesh is creamy, moist, and crisp, encasing a few small black-brown seeds inside of a central core connecting to a dark brown stem. Corella pears can be consumed when firm and crunchy or can be left to ripen fully and consumed when soft and creamy. They are aromatic with a fresh, green scent and are very juicy with a sweet, mild flavor. Corella pears are available in the spring through fall. Corella pears, botanically classified as Pyrus communis, are an Australian variety that grows on trees that can reach up to five meters in height and are members of the Rosaceae family along with peaches and apples. 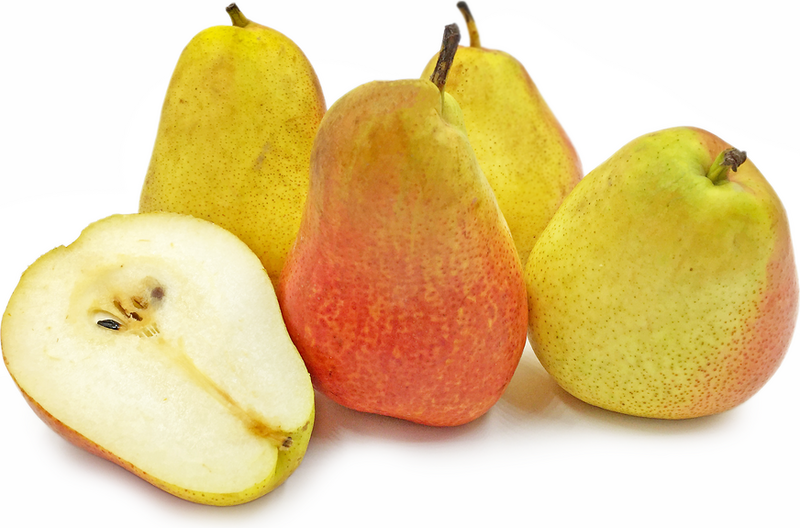 Corella pears are favored for their colorful flesh and creamy consistency and can be used in both fresh and cooked applications. Pears are a popular fruit to grow and eat in Australia, which has a favorable climate for cultivation, and around 130,000 metric tonnes of pears are grown in the country annually. In 2014, Australia also celebrated the first Australian pear month to showcase and bring awareness to the unique pear varieties available. Corella pears contain vitamin C, fiber, and potassium. They also contain levulose, a particularly sweet form of natural sugar that is found more in pears than most other fruits. Corella pears are best suited for both raw and cooked applications such as poaching and glazing. Corella pears can be consumed when they are slightly under-ripe and crunchy, or when they are ripe and much softer. To check ripeness, gently push on the flesh around the neck of the pear. If it is ripe, it will give a little and signify it is time to be consumed. Corella pears are commonly sliced in salads, poached in a light syrup with spices and aromatics, cooked with pork chop and mustard, or baked into a tartlet with a vanilla and cinnamon compote. Corella pears compliment meats such as smoked chicken, pork chop, and prosciutto, baby spinach, chives, garlic, onion, parmesan cheese, walnuts, crusty bread, balsamic vinegar, fennel, pine nuts, orange, vanilla, maple syrup, cinnamon, saffron, ginger, citrus zest, lemongrass, lime leaves, whole star anise, cardamom, espresso, shiraz, and yogurt. They will keep for 1-2 weeks when stored at room temperature or for a couple of weeks when stored in the refrigerator. Corella pears are named after the Australian corella parrot, which is a native bird known for its bright and colorful plumage, and these pears are named such for their pink blush that develops over the green skin. The first Corella pears were grown in the Barossa Valley in southern Australia by German settlers during the late 19th century. 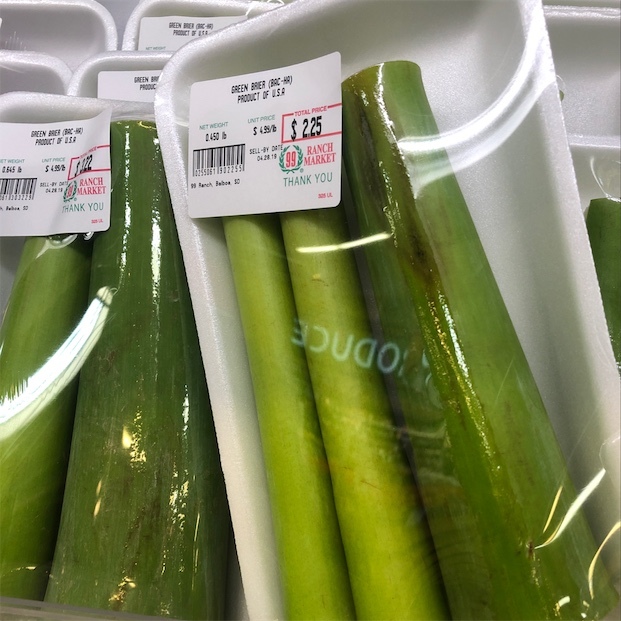 Today they are grown predominately in Australia and can also be found in Asia and Europe at farmers markets and specialty grocers. Recipes that include Corella Pears. One is easiest, three is harder.